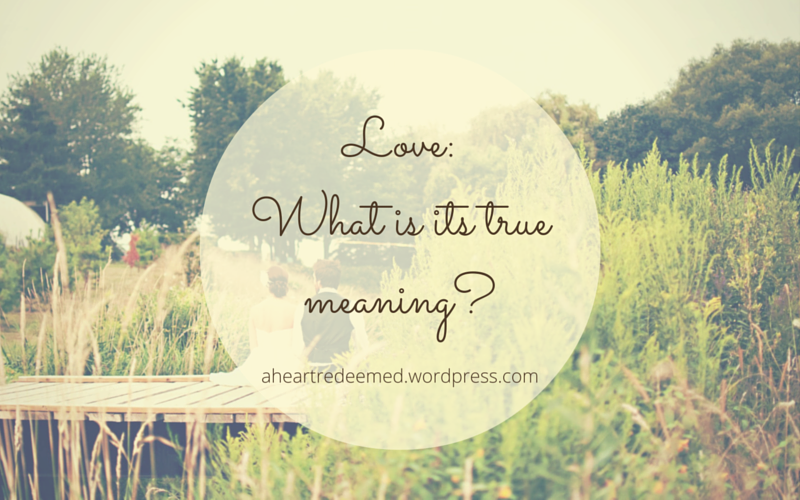 Love: What is its true meaning? We are immersed in a society full of immortality. There’s no denying it. This is a sinful world full of sinful people. We can’t escape it. It’s all around us. In some subjects I believe that society has gotten so confused on what is morally and realistically right, that even Christians have a hard time seeing the truth. We’re just as confused as they are. And I’m here today to talk about one of those subjects. Love. The type of love that later may evolve into marriage. This subject has been so twisted and corrupted that nowadays it means something totally different from what it was supposed to mean. How has love come to mean what it does today (That is, a sexual relationship based on mainly feelings and physical appearance.)? Well, I’m pretty sure media has played a big part in it. Whether it is movies, books, music, etc., they have all in one way or another projected this false image of what love is. Now, I’m not saying that all books and all movies and all music is that way, but much of it is. This, in part, is why so many marriages are torn apart. Because they expect marriage to be like an image that they have accepted as true from what they have been taught, but it is not. The reality is that love is not at all like what the world has told us. It is something better, something more. But where can we find the true meaning of love? We can start by going to the Bible. For who else could tell us more about love than the One who proclaims that He is love? Love is now based on feelings and emotions between a man and woman and even between a man and man or woman and woman. It is not at all what it was supposed to be. Yes, feelings and emotions play a part in love, but those types of things can’t be relied on to last. The love that Christ shows us is deeper than that. His love is sacrificial. It’s everlasting. I’m not claiming to know everything (I’m not married. ), but if we could even begin to show that type of love in our marriages today, I believe we’d have a glimpse of what true love looks like. We’d begin to see the kind of love that God shows us. The kind of love that’s willing to make sacrifices. The kind of love that places others first before themselves. The kind of love that endures. Don’t trust the world’s standards for marriage. Trust in God’s standards. Love is between a man and a woman. It certainly isn’t easy. But with God at the center of it, it’ll be going in the right direction. And that will lead to a long-lasting marriage. But ‘God made them male and female’ from the beginning of creation. ‘This explains why a man leaves his father and mother and is joined to his wife, and the two are united into one.’ Since they are no longer two but one, let no one split apart what God has joined together. Maybe you are already married. Maybe, like me, you’re not. But let’s look for this kind of love in marriage or in the one we hope to have. Oh dear. What do I say? What an spectacular ending to an amazing trilogy! This was better than Siren’s Fury, but I still think Storm Siren might be the best one out of the whole trilogy. But they’re all great, let’s just say. I’m glad and sad at the same time. It was so good, but now it is over. It was so great to have the real Eogan back. I missed him badly in the last book. He’s tough. He worries way too much about the safety of others. And he is very protective of Nym which is perfect because she needs someone like that. This book displays her willingness to make sacrificial decisions. She is always getting herself in life threatening situations. Just because she has powers, doesn’t mean that she is invincible. Her past has broken her in a way. She needs someone who cares for her life, and Eogan fulfills that role. Rasha and Myles are growing characters in this book. They hold a lot of intrigue for me. Kel is a great fun addition to this story. He adds some humor to the story. Draewulf is so so so evil. He is quite a complicated character in and of himself. In this book, Nym and Eogan’s relationship gets much more intense. So there was quite a few kisses shared or at least they say they want to kiss, but don’t. I feel like there is more to their relationship than physical attraction, but it is barely mentioned. Meanwhile the physical attraction is said every time they are together. That got a bit annoying at times. There was so much action and anxiety. The battles kept you on the edge of your seat. You never knew when something was going to go wrong. It was bloody at times, but I don’t think it was too bad. The plot twists were great and terrible. There was a moment when I thought this trilogy was going to end worse than the ending of Storm Siren, but thankfully there were some more pages. It ended in a perfect way (Even though I’m still a bit confused about how it all worked out. ), full with hope and tragedy. I just love this writing style people. It is georgous! So raw and heart wrenching and beautiful. The breathtaking similes that can literally pull tears from your eyes. It is incredible first person. I need more books by this author. This is an amazing! I’m recommending this to all fantasy lovers. Go read it! Don’t think twice, just read it! I read this quite a few months ago for school. Then school told me to review a nonfiction book I’ve read. I really enjoyed this one so here’s a review. This is certainly what Sam R. Watkins does. He tells his story of joining the First Tennessee Regiment, Company H, to fight for the Confederacy. He recounts their victories and their defeats. As one of seven of the original recruits to survive all of their battles from Shiloh to Nashville, it is a unique story. He tells the story not of a general or lieutenant, but of the average private and his thoughts on the war. I really loved this story. It made the Civil War just come alive. The battles were so real and very bloody. There was such sad and dreadful memories. It was really shocking. So many people died either from being killed in battle, battle wounds, or infection in the wounds. The author does describe some very literally torn up people, but I loved the reality of it. He is recounting what he saw onto paper. But this book doesn’t just dwell on the battles. There is also a good mix of humor which included lots of humorous stories. He tells of letters from home, staying at people’s house, and visiting hospitals. He tells the true thoughts of the foot soldiers. How there were certain leaders that they despised. How, at times, they just wished for the war to be over and they didn’t care who won anymore. How the Confederate soldiers would chat from where they were positioned to the Union soldiers across the way. This showed me that a lot of people signed up for war thinking it would be exciting, an adventure, and they expected it to be over soon. Once they saw the reality of it, most of them didn’t want to fight anyone. But they were brave enough to not desert, because they would be executed or hanged if caught. They fought, even as they knew (towards the end of the war) that they were losing. The writing style was different. It was first in person, but in past tense. I liked it though. It felt so much more true. Like an old man telling his story to you. This was such a rich book and so full of life. I’ll recommend this book to anyone who can handle the bloody descriptions, because it is really worth the read. It opens your eyes to the truth of war. I find myself at times to be a very prideful person. I may not talk like I am, or act like I am, but I am prideful. Pride is “a high or inordinate opinion of one’s own dignity, importance, merit, or superiority, whether as cherished in the mind or as displayed in bearing, conduct, etc.”. I must say I have a very hard time discouraging those prideful thoughts. Those thoughts that pretty much all same the same thing: I am better than you. But don’t we all struggle with pride in little ways? God call us to be the opposite of prideful: humble. God calls us to be humble. We all struggle with it, some more than others (like me). Pride is a fundamental part of our sinful human nature. But humility is something we all must summit to, if we’re to take those first steps to being saved. That humbleness to admit that God created and controls the word. That humbleness to submit to the one and only God. That humbleness to confess that we’re sinful and we need help, help that we can’t give ourselves. All of it takes strength. Strength that we don’t have. God, He freely gives His strength. It is always there for us. But we can be too prideful to take it. We trust only ourselves. We don’t want to rely on someone else. We want to earn our own salvation. We don’t want to feel like we owe something to anyone. But we already owe God everything. The earth we’re standing on, is His. Our very lives belong to Him! Everything we have, everything we were, everything we are, and everything we will ever be is in His hands. By His grace we’re alive! It is all belongs to Him. All we have to do is give Him our hearts. He gives us the strength, and we make the choice. Though it is hard for us to let go of pride, we must realize that nothing we do is done by our own strength. It is all through Him. Nothing we do is done through our own strength. We just have to learn to trust and rely on Him. It will be such a relief once we do, but we must take that first step. And we might have to keep taking that step, because it is so easy for us to forget and try to bring everything under our control. We want to be in control, but we need to let it go. Because holding on to pride will get us nowhere. God is our strength. We can rest and have peace in Him, if we only are humble to give ourselves fully to Him. He is our rock, our foundation. On no one else can we find the strength we so desperately need. We need help, help only God can give. Let’s find our strength in Him and let go of our pride. Oh, oh…this was amazing and so intriguing. Agh! How is this series going to end? Blue has become so close to these Raven Boys. Neither the Raven Boys or Blue could imagine one without the other. Among all the things she may have discovered with these Raven Boys, sadly the one thing she never wanted to come true is: she is finding her true love. But she is also learning that what you have you can lose so easily, like mothers, lives, friends, and certainties. Will she be able to find any of them again? These characters are really growing. Ronan is turning over a new leaf. He is slowly learning to be a bit more like he was before his dad died. He is a bit more kind and caring, especially to Blue and Adam. Adam is ever changing and I don’t think I’ll ever truly know him now, but he’s learning not to take every as charity and pity. He’s is accepting truth and friendship for what it is. Gansey and Blue’s relationship grows, but their differences may also break them apart. Gansey is struggling and is fearful in a way his friends haven’t seen before. I love seeing this new side of him, even if it is terrible and sad at the same time. Poor, poor Gansey! Blue is tired of holding her secret from Gansey any longer. She misses her mom and she wants to be able to kiss someone. Then there’s Noah. What is going on with Noah?! I’m freaking out over here! Don’t leave please! This series never ceases to surprise me. Every book I’m learning some new secret, whether it is about someone’s past or about a person’s being in general. I probably could read this whole series and find out so many things that I missed the first time. I felt like I could tell what the plot was in this one, so that was a relief. But I still just can’t comprehend it all. There is so much underneath the surface that you can miss if you’re not looking close enough. It’s beautiful in that way. The buildup leading to the end was very intense. The end was even more intense and exciting. Oh my goodness, I can’t believe everything that is happening. It is funny how normal this world feels at one moment, then how magical and supernatural it feels in the next moment. I have loved it. It is so paranormal. Ronan’s abilities are so interesting. Adam’s connection to Cabeswater is hard to decipher. Noah, strange things are always happening to Noah. Blue I think we’re still learning more about. There was plenty of language again, including: f***, d***, s***, a**, and a few others. Though there definitely wasn’t as much language as the last book. So that was good. There were some gay references, but without anyone ever saying the word gay. So at times I couldn’t tell when they were talking about it or what the intention was. A married couple in this book were mentioned as hardly wearing any clothes while in their house, but nothing came of it. It was just said and that was it. I really enjoyed this. The writing is stupendous! I need the next book now! How is it all going to end? It can’t end happily, and it’s worrying me like crazy. If you can handle the language, go read this now. This is so unique. This was quite good, but very strange and weird. If you were expecting Sherlock Holmes, well you’ll probably be a bit disappointed. So if you can get over the weirdness and strangeness and how it’s not really like Sherlock Holmes, then I think you will really enjoy this. Abigail Rook arrives in New Fiddleham, New England just about broke. On her search for a job she meets R.F. 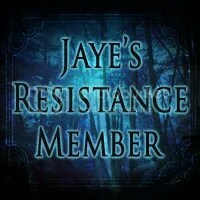 Jackaby, an investigator who is in need of an assistant. On their first case together they realize that there is a serial killer on the lose. With Jackaby’s keen “sight” to see supernatural beings, he believes that the killer may be more than just an ordinary man. Instead of being this really smart guy R. F. Jackaby is a person who has this special “sight”. He can “see” things that normal people can’t. So he specializes in unexplainable phenomenons. Abigail Rook is an impulsive girl who ran away for college and her family to go digging up dinosaurs. Jackaby is so like Sherlock in his personality, but there are some differences too.. He talks to himself. He clothes are horrendous and mix matched and his hair is unruly. His house is just a wreck. Of course Rook is supposed to be like Dr. Watson. Rook is brave and willing to do much to get her way. But at times, she is afraid that she is making some unwise decisions (which maybe she is). The plot thickened quickly. Actually, I think this book went a bit too fast and was a bit too short. I felt that it could’ve been drawn out a little more, but it was still great. That conclusion was amazing and terrifying. I wasn’t expecting it. The world is so 1890s. I loved that it had such a historic feel to it. I was just swept up in that beautiful and classy world. Jackaby’s house was a separate world in itself. The ghost, the duck, and the room that shouldn’t even be possible was so intriguing. I can’t wait to see more of it all. The murders were a bit descriptive and very bloody so this would probably be best for older teens to read. I don’t remember there being anything bad in this book except for maybe a litt bit of language. It was a great book. This was a different book from what I’ve been reading lately, but I really enjoyed it and am excited to read the next one. Take time to read this strange and unusual book. Illegal immigration has been a steadily growing problem for the United States over the past several years. 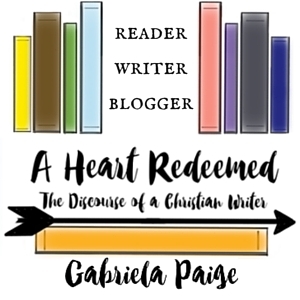 In this essay I would like to give an overview on illegal immigration, how it affects us, how it relates to the Bible, and maybe some pointers on what we should be doing about it. Illegal immigration is very real and it has got the highest it has ever been in 2007, when it was calculated that there were around 12.2 million unauthorized immigrants in the U.S. It has decreased since then by about a million, but that doesn’t mean that it is alright. This kind of kind of immigration affects our economy, maybe not as drastically as some people would like to think. But if we just keep allowing illegal immigrants to come and take a little of what we have, that is an open invitation to take all that we have. Many immigrants take jobs (which can affect those who have citizenship and are in need of a job) in the U.S. and give the money to support people back in their home country. This means the money doesn’t cycle back into the economy, which in turn hurts it. Those immigrants are also willing to work for a lower wages because our money goes much farther in their home country. This can hurt the average American who is trying to get a job with good wages. The Bible teaches us to help the poor, care for the sick, and feed the hungry. We’re to love others as ourselves. We’re also told to submit to the authorities placed over us because they were placed there by God. To honor and respect them and to follow them as long as it doesn’t contradict God’s Word. To illegally come into another country, is well, illegal. We need to be able to prevent illegal immigrants from coming into our country at all. Then we wouldn’t have to worry about dealing with all the mess of deporting them. But because we haven’t been active enforcing the law, there are now over 11 million illegal immigrants in our country! It would be pointless to try to deport them all now. We have so many (most having already been here for years), I think we should give them a way to become legal immigrants. But for those trying to come to over now, we should enforce the law and deport them. I know that there will always be a few who will make it in illegally, but we shouldn’t have allowed it to grow this large. If a person really wants to come and live in our country, they can take the time to come in legally. In considering the children born in America to illegal immigrants, I believe it is alright to consider them as citizens. It wasn’t their choice where they were born or their fault for the decisions their parents made. In conclusion, the government needs to enforce the laws that have been created. If we can’t enforce such laws like this, how can we enforce all the other laws justly? We must stand firm with the laws that have been put in place or our government will crumble like a house built on sand. I loved this book! But I must say, I’m not sure if I got the plot (or the point) to this book. Maybe I’ll get this as I read the rest of the series. Ronan has secrets. Some he keeps from others and some he keeps from himself. One secret is that he can bring things out of his dreams. What comes out is not always what he wanted, but there are others who want those things. Blue and the Raven Boys are on the search for the Welsh King Glendower. Gansey’s obsession with Glendower has infected all the boys and Blue. They feel that they are getting closer to finding Glendower. The secrets and the way to Glendower are now coming out of the dark. The only thing that’s certain is that this will bring change. Oh man, I just have fallen in love with these characters. They are each so different and so special in their own uncommon way. Blue just defies the world with her style of clothes and by just being herself. She is so torn in this one. Ah, I’m heartbroken for her. It was so sweet what Noah did with Blue, but I don’t think it was the most appropriate thing, but it was done out of kindness and curiosity. Adam’s changed and I don’t even think I know the half of it. Those choices that Adam made…I think they are starting to have an impact. Gansey you’re trying to keep the gang together, but sometimes you just have no clue. Other times, oh my goodness you’re the best person ever! Then there’s Ronan which was who the book mainly focused on. Learning about his past and his gift was so intriguing. I love how this is written. I love the way things are said and not said but understood all the same. It is just so neat. The character development is perfect. These characters might just be the death of me. Because it did focus on Ronan, there was more language than the last book. F*** and s*** were probably the ones most used. There was a bad hand gesture thrown in about two times. The use of God’s name in vain was there. Ronan drinks until he’s like drunk while trying to accomplish something important. One person I think was asking another if he was gay without really saying the word gay for a moment. There were a few kisses shared (not gay kisses). One time it was said that two people (not married and not central characters) were laying in bed together before a phone call and then it moved on from there. This one didn’t have much psychic stuff in this book, but there was plenty of intrigue and action. It had a few really intense and crazy moments (What just happened to the normal world?). There were these creepy night horrors (scary monsters pretty much) and just a few fight scenes that I could tell were bloody, but it didn’t go into detail. Even with its faults, I just loved this. I’m recommending this series to older teens. It’s such a unique read that you won’t find anywhere else. What an amazing book! I was expecting something great, but not such a prodigious book (Yeah, go look up that word.). There is another world that we see glimpses of in our dreams. We lives two separate lives: one in this world and one in the world we only dream about. Chris has dreams of a lady begging him not to come to her right before shooting him in the head. They are only dreams until he wakes up in that world. He has a strong belief that he is going insane. Then Chris makes some very bad mistakes and realizes that this may all be real. But the consequences of his mistakes may destroy both worlds if he doesn’t find a way to fix it. I started this book and it seemed pretty good, but nothing special. Well it didn’t take long for that to change. The characters were memorable. I loved Chris and Allara! Chris was a average man who was running away from facing his family problems. He makes some major mistakes, but he’s willing to do whatever it takes to fix it. He was determined once he set his mind to something and brave to the point of recklessness. Allara was tough and fearless on the outside, but underneath all that armor she was fearful and worried. She wanted peace but didn’t know how to get it. Quinnon was a hardened warrior. It would take awhile to earn his respect. He was willing to follow through hard decisions. Orias was a Cherazim and an heart wrenching character. At times I liked him, other times I didn’t. Worick I didn’t see enough of. But I loved that parts I did see of him. He was such a father figure. A good and trusting friend Mike. Brooke was just crazy. She’s one of those characters who you need to look out for. She’s out for an adventure…and trouble. Once you get past the first few chapters this was a really fast paced book. There was action left and right and it just never slowed down. Oh, it had me worried so much! The battles were so intense and felt very real. There were a few instances that felt a little rushed and maybe a tiny bit easy, but for the most part it flowed smoothly. The world building was fantastic. The Rievers and Cherazii were so cool and fit the story like a glove. I loved how there wasn’t just medieval weapons, but canons and different sorts of guns. It made the story stand out more. The skycars were another unique feature to this world. All of it was awesome. I’m recommending this to older teens because it was bloody in some of the battle scenes, but otherwise anyone could read this. It was such a good mix of modern world and fantasy.